A grizzled little league coach (Thornton) tries to turn his team of misfits into champs. BEFORE: Not since before I started this marathon and watched both versions of True Grit, the 1969 and 2010 films, have I watched an original and remake of the same film on the same day. Earlier today, I watched the 1976 The Bad News Bears and found it very entertaining. Now it’s time to watch the 2005 remake that dropped the ‘the’ from its title, Bad News Bears. As I mentioned in the first review, this remake is supposed to be considerably worse than the original but it does star Greg Kinnear so I’m hoping for a silver-lining. AFTER: Have you ever heard of the saying, “If it ain’t broke, don’t fix it?” Well in terms of Bad News Bears I’d like to amend that statement to, “If it ain’t broke, don’t go breaking it.” There’s no reason to do a shot-for-shot remake of a film that was already very successful. Instead of trying to come up with an original take on the classic, the director Richard Linklater went for the easy route and just made minor changes to location, names, and actions compared to the original. Now this in and of itself isn’t what makes Bad News Bears a bad film. What makes it bad is that while it looked like the original, it didn’t feel like the original. Most of this is the result of a cast that doesn’t click as well. The kids’ actions feel forced and planned instead of natural extensions of their characters and the adults weren’t much better. Something interesting to note is I did laugh more at Bad News Bears than the original. The obvious conclusion would be the remake is funnier but I have another theory. Watching both films in the same day the similarities were very apparent, more so than if I saw them a year apart. I think I was laughing more at the many homages made to the original than the jokes themselves. Case in point is the scene where Buttermaker (Thorton) is trying to get a sponsor for the team jerseys. I won’t spoil the punchline but I will say it was very clever. My advice is to just watch the original 1976 The Bad News Bears. 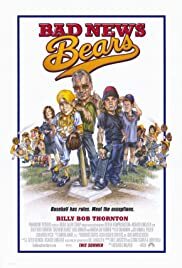 However, if you feel compelled to watch this 2005 remake Bad News Bears, say you’re doing your own movie marathon, watch it right after the original.